Enjoying the early spring weather and, and are ready to turn our attention to good food and wine for April. Meaning that it’s time to look forward to the next John and Ewan’s Wine Club dinner. We have teamed up again with renowned French restaurant The Bleeding Heart and invite you to experience a unique food and wine matching dinner. There will be a fabulous menu with six lovely wines chosen to complement it and to delight you. We will be featuring wines from the award winning Wanderlust Wine, which was chosen by The Independent as the best wine merchant in 2017. 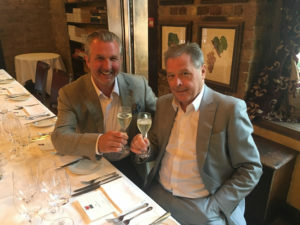 John Davey (Guy Savoy; The Ledbury; The Square) is looking forward to hosting you on this very special evening. Ewan Lacey (Channel 4 wine specialist) will expertly guide you through a four course menu tasting exciting wines with each course. As ever, the dinner will be delicious, the wines harmonious and the conversation convivial. We look forward to welcoming you to another fantastic evening.